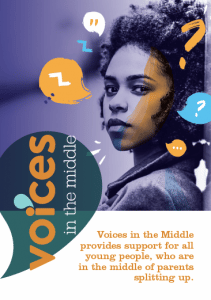 Thank you for your support of Voices in the Middle. We have developed a range of resources for you to use with your clients. 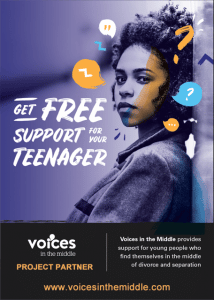 By using these resources, you will be both supporting families directly alongside helping us raise awareness for young people in the middle. Take a look at each below and then use the order form at the end for your copies. Raise awareness about the support we can offer for your client’s children and what resources we have for parents also. 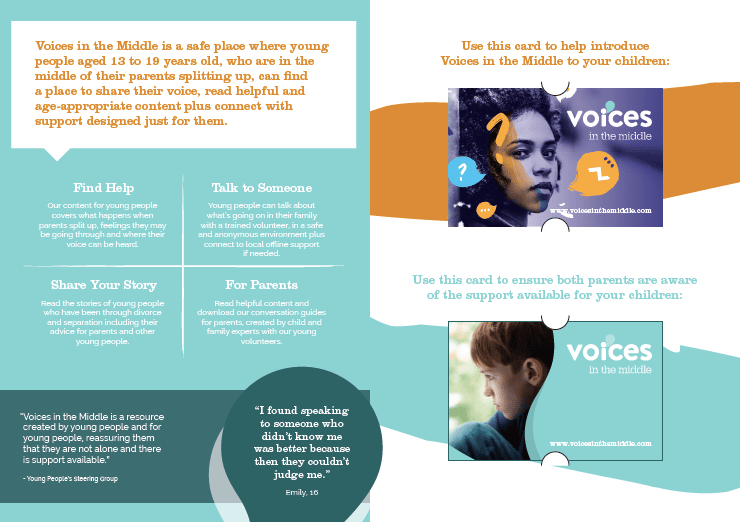 Our leaflet contains lots of information for accessing support alongside detachable business cards for the other parent and for children (with QR code on the reverse for direct access to support). 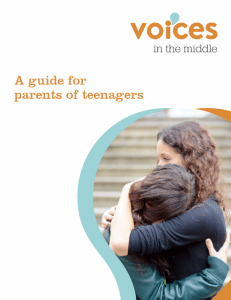 In this guide, parents can read about how to talk to and support their teenager in the middle of divorce and separation, including their rights, well-being and protecting their family relationships. 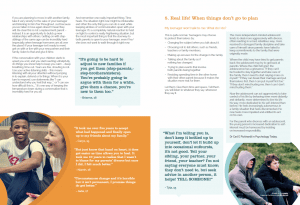 Written with our young volunteers, family lawyers and child development experts. We will co-brand your PDF with your logo on the front cover as a resource you can use with clients for free. Display in your preferred locations to help raise awareness of Voices in the Middle and demonstrate your support for children. Please fill in this form to get your Project Partner materials and we will be in touch confirming your order. As a charity, we rely on your donations for Voices in the Middle to exist. For this reason, some of our materials require a small charge for printing and postage, these costs are in brackets below.